Many of Iceland’s most visited attractions lie on what is known as the Golden Circle and on the South Coast. 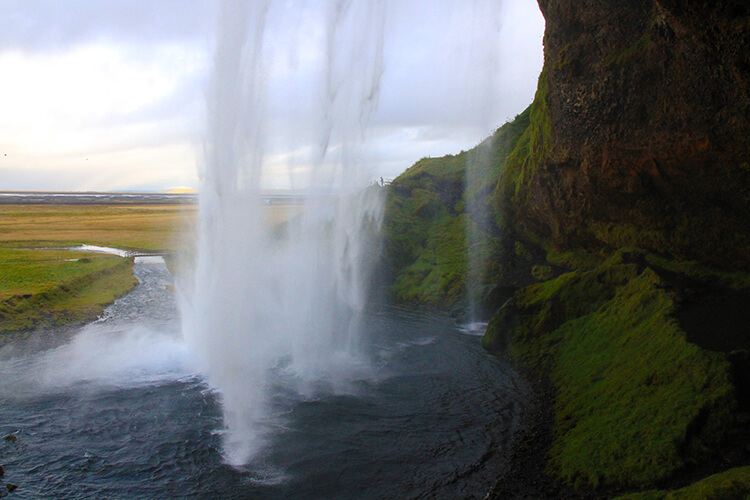 Any number or tour companies take tourists by the busload out to attractions like the popular Seljalandsfoss that you can walk behind, the mysterious Skógafoss said to be hiding a treasure chest of gold, and Jökulsárlón where you can get up-close with icebergs. But bus tours miss many of the best parts – the secret Iceland South Coast attractions like the waterfall tucked just behind a canyon, the swimming pool where only the locals go and the other iceberg lagoon where you can kayak. Renting a car is more than just freedom; it’s like going on an expedition of discovery. Heard about that hike with amazing views at breakfast? A rental let’s you hop in the car and go. 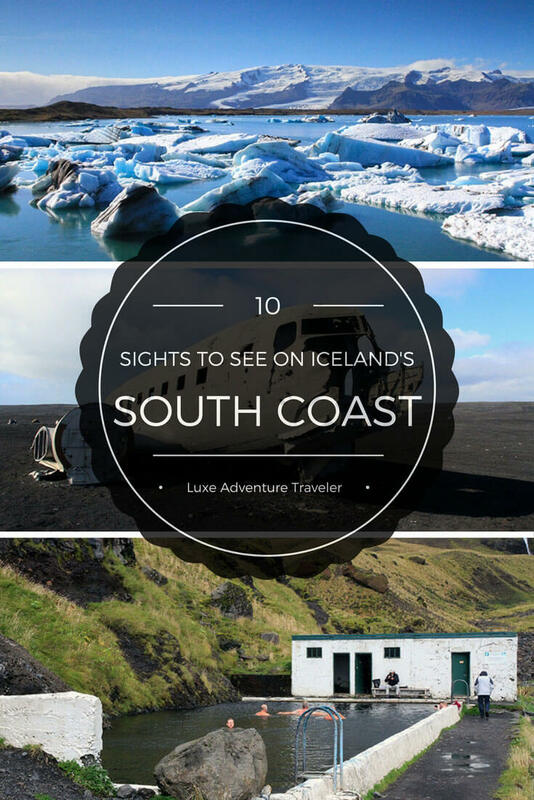 And until the bus tours start stopping at all of these Iceland South Coast attractions, a self-drive tour is your only chance to discover all of them from Hella to the Heinaberg Lagoon. One of the best known waterfalls of Iceland, the 65 meter high Seljalandsfoss is so popular because you can easily walk behind this waterfall. A walking trail leads around the side of the waterfall and in only a couple of minutes, you can capture a unique photo from behind the waterfall. It’s the only known waterfall of its kind in Iceland, making it one of the 10 most photographed natural wonders of Iceland. In winter, the walking path is often closed because of danger from it being icy and slippery. But no matter the time of the year that you visit, Seljalandsfoss is right off of Route 1 and worth a stop for the photo op. Just don’t forget a rain coat because the spray from the gushing waterfall will definitely leave you wet. Gljúfrabúi Waterfall is easily the secret Iceland South Coast attraction most likely to be missed. That’s because only a couple hundred meters away its more popular neighbor, Seljalandsfoss, is tumbling over the cliff and alluring visitors to go behind it. But follow the path a short ten minute walk behind the campsite just down the road, and you’ll find this beauty hidden in the Trollagil (Troll Gorge) Canyon. 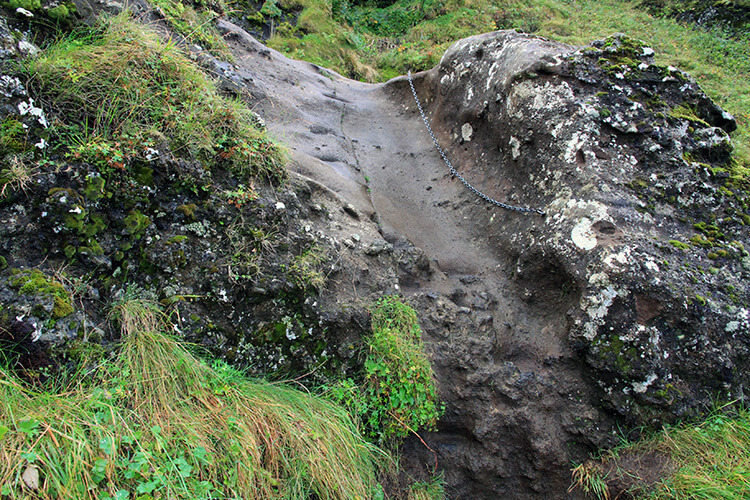 Gljúfrabúi makes you work to get to it by climbing up the steep, and often muddy, cliff face. But the short hike, which involves pulling yourself up the most dangerous parts with chains anchored into the rocks, is worth it for an up-close look at the waterfall. 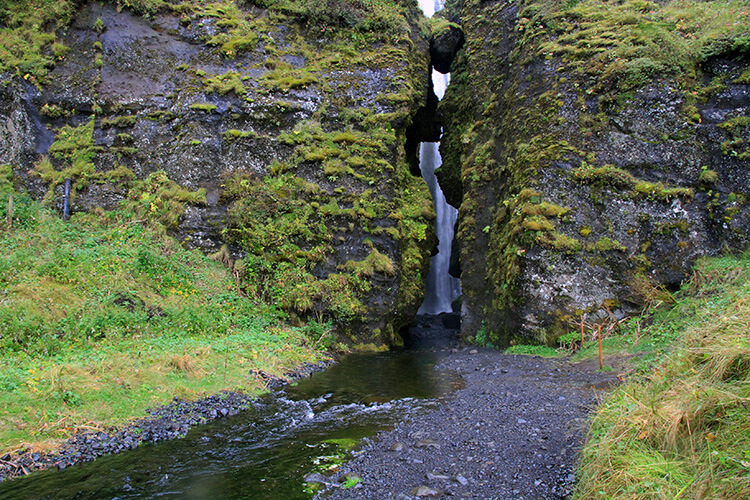 It’s less voluminous than its more popular neighbor Seljalandsfoss and is spring fed. From the road, only the very top is visible because of a boulder that blocks it. The boulder, named Franskanef, is said to be the residence of hidden people (or elves). Turnoff Road 1 for Seljalandsfoss. Either walk from Seljalandsfoss or drive past the parking lot for Seljalandsfoss and continue down the road to the camp ground about 1 kilometer away. Keldur is said to be the oldest surviving turf house in Iceland as it was mentioned in the Sagas in the Middle Ages. Though improvements have been made as it was lived in up until 1946, when the house was then given to the National Museum of Iceland. The family still owns and operates the farm that the turf houses are on, but each summer visitors can take a look at what life was like in these houses. According to the Saga Njálusaga, Ingjaldur Höskuldsson lived here from 974 and in the 12th – 13th centuries, the powerful Oddi clan took up residence, and their chieftain, Jón Loftsson, lived at Keldur until the end of his life. Skúli Guðmundsson was the last resident, who lived in the house from 1862 – 1946. Skúli’s grandson and his wife now live on the farm and proudly show me around, kindly opening for a special visit. The house is just one of a group of buildings. 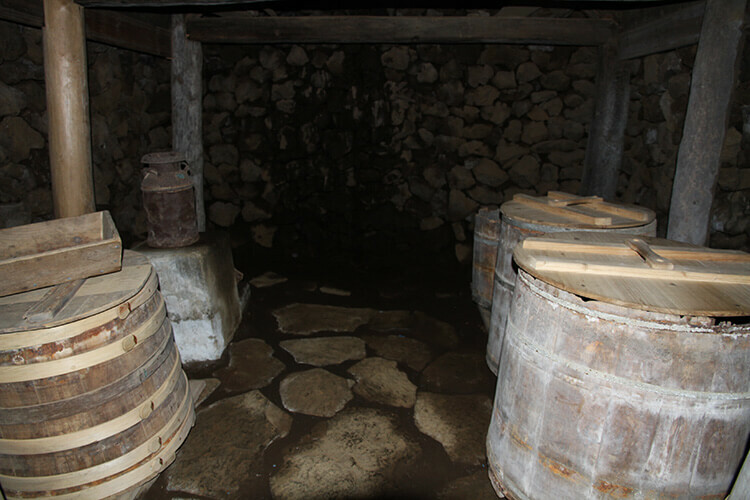 There is also a storehouse, a smithy, a millhouse, a cattle shed, a stable, a sheep corral, and an escape tunnel. We have a look around the house and though many items have been removed to be on display in the National Museum, there are still pots and pans in the kitchen, beds, a crib, and some of the other furniture in the house. It’s much larger than it would appear from outside and quite interesting. Definitely worth a visit. Keldur is open June 15 – August 15. Turn on Road 264 from Road 1; the turnoff is almost directly across the road from Hotel Ranga. Eyjafjallajökull is the volcano that brought the world’s air travel to a halt as the volcano erupted for nearly six weeks in 2010 and what first grabbed my interest to add Iceland to my bucket list. So no trip to Iceland would be complete without at least seeing the now sleeping giant. 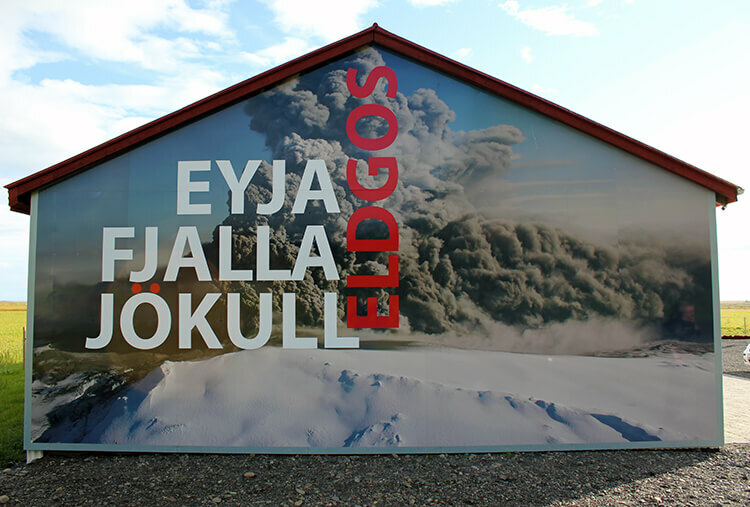 The Þorvaldseyri Visitor Center opened on April 14, 2011, exactly one year after the start of the Eyjafjallajökull eruption. Because it’s at the foot of the volcano, you feel first-hand what it is like to have a huge volcano looming over your shoulders, just as at the Þorvaldseyri farm. 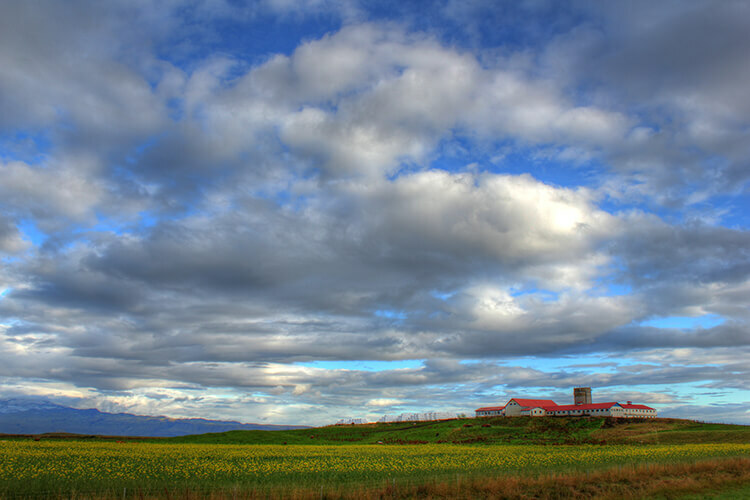 The Þorvaldseyri farm became famous after the 2010 eruption and incredible challenges met by the family farm, which had to evacuate and relocate during the eruption. Looking at the area surrounding the farm, it is hard to imagine that over a year later the clean up of the extreme amounts of ash that fell is still a work in progress. The area is lush and green; not at all what you would expect looking back at pictures of the farm. 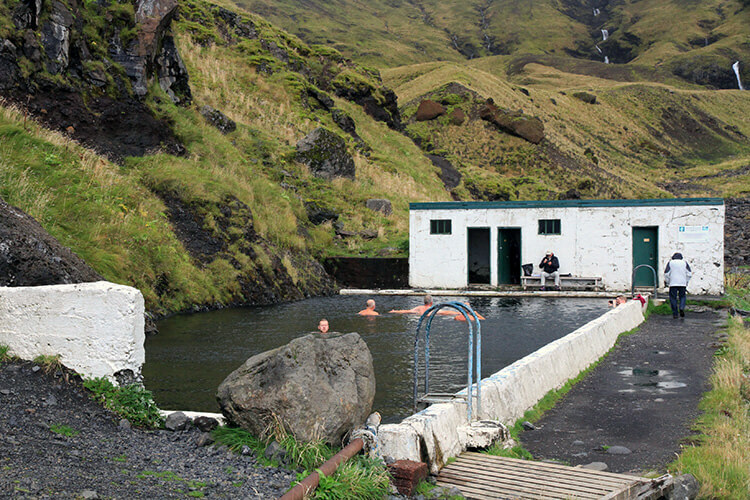 Nestled in a narrow valley beneath Eyjafjallajökull, the volcano that famously shut down air traffic for 10 days in 2010, Seljavallalaug is Iceland’s oldest swimming pool. Now abandoned, it was built in 1923 and was considered an engineering marvel at its time. Its designers were clever and utilized the natural rock of the mountain as one of the four walls of the pool and the geothermal water from the area trickles down the rock and right in to the pool, keeping it a warm 38°C. Seljavallalaug fell into disuse when a swimming pool was built 2 kilometers closer to the small community in 1990. Volunteers generously keep it clean and it is perfectly suitable for swimming. There are even the changing rooms still standing from when the pool was thriving, though don’t expect much from them. The pool is no roadside attraction. A small gravel road takes you several kilometers into the back of a valley and you’ll pass another abandoned swimming pool on the drive. Don’t let that swimming pool fool you! Drive until the road ends and this is where you’ll begin a 20-minute hike to the pool. You have to cross a river several times and if it feels like you can’t possibly be going the right way, just trust that you are. The pool is tucked into a hidden corner of the valley and you won’t see it until you are about 50 meters away. To find Seljavallalaug, turn on Road 242 (marked Raufarfell) from Road 1 just past the small Þorvaldseyri exhibition. Legends of buried treasure and the two snow capped glaciers visible just behind make the 60 meter high Skógafoss a magical place. On a sunny day, a vibrant rainbow can usually be seen shimmering across the waterfall that spills over the cliffs of the former Icelandic coastline. 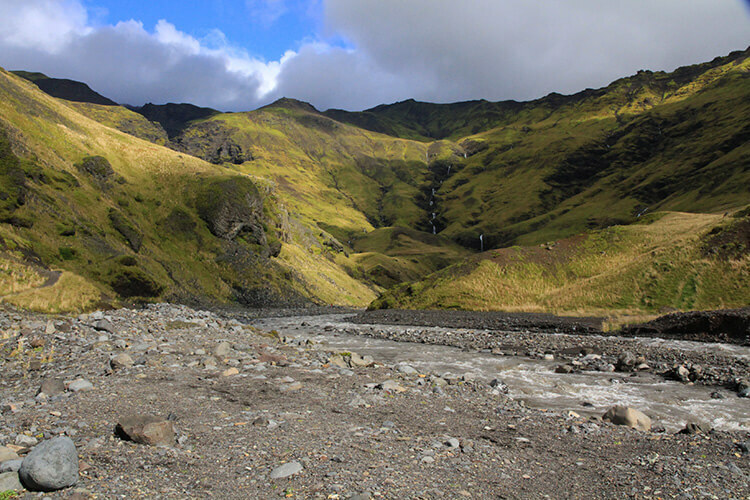 And the Skógá River that Skógafoss drops dramatically in to is rich with salmon and Arctic char, so fisherman are often seen here fishing for them in season from July through October. 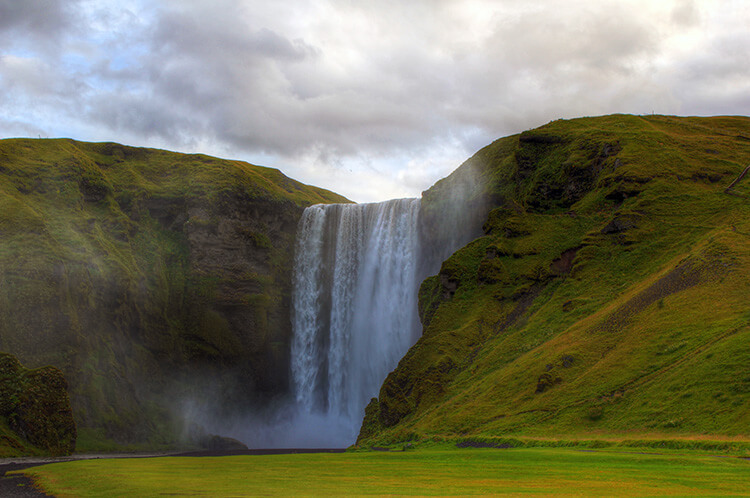 Of course, since Icelanders love their tales and legends, there is one about Skógafoss. The first Viking settler in the area, Þrasi Þórólfsson, buried a treasure chest filled with gold coins in a cave behind the waterfall. On days when the sun is shining, it is said that his gold can be seen glittering through the water. Many have tried to find the chest, and once a young local boy succeeded. He tied a rope to the chest’s ring and pulled. He was only able to retrieve the ring and the rest of the chest disappeared. The ring was later used for the church door at Skógar. There’s a make-your-legs-ache staircase leading up to a viewing platform overlooking Skógafoss if you’re up for making the climb. It offers a unique vantage point to look down on one of Iceland’s most popular waterfalls. 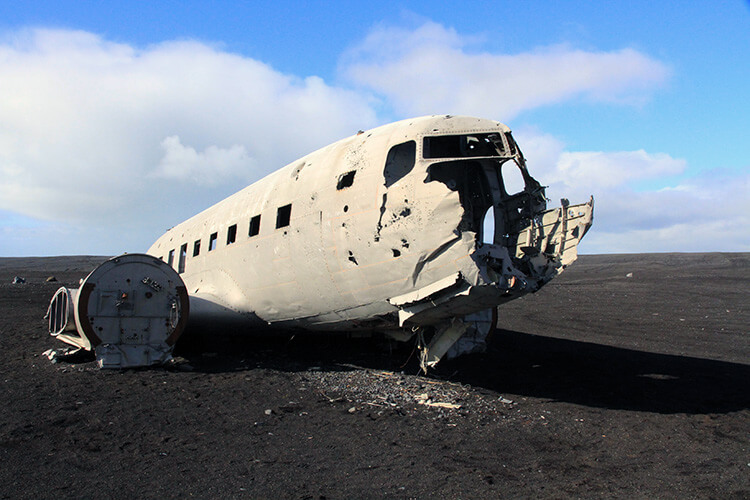 On November 24, 1973 a US Navy DC3 crash landed on the black sand beach Sólheimasandur on the South Coast of Iceland when the plane ran out of fuel…or so the pilot though. Everyone survived the crash and it turned out that the pilot simply needed to flip a switch to the other fuel tank. 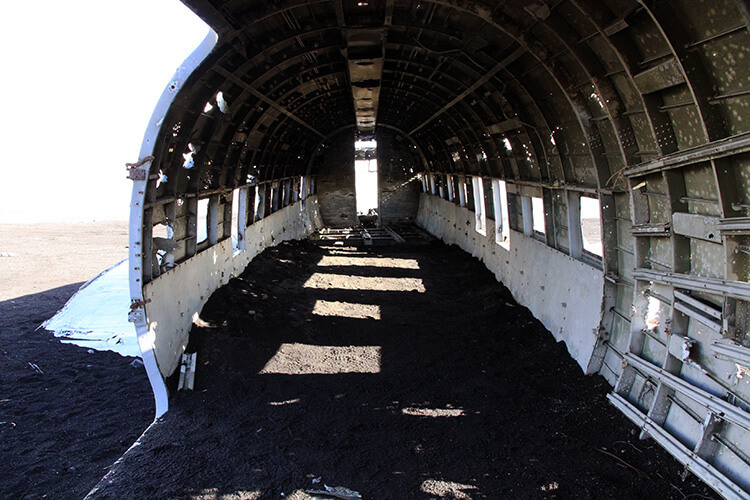 For whatever reason, the plane was abandoned – left to forever rot on the black sand dunes. The Navy officers must have thought they landed on the moon on that November day. The black sand dunes are surreal and the landscape is completely desolate. It’s no wonder this site is a favorite of photographers and many filmmakers and advertisers have shot here. If you had a 4×4, you used to be able to actually drive right out to the plane crash. Unfortunately, tourists were disrespectful and in 2016 the farmer that owns the land that the crash site is on was forced to barre access to vehicles. Now the only way to reach the plane crash is to walk the 4 kilometers from the turn off on Route 1. It should take about 1 hour each way and because the crash is below a sand dune, it suddenly appears like a mirage when you are about 100 meters away. Keep in mind that the winds are often much stronger at the shore and the area is prone to sand storms, so just use caution when visiting the plane crash site. 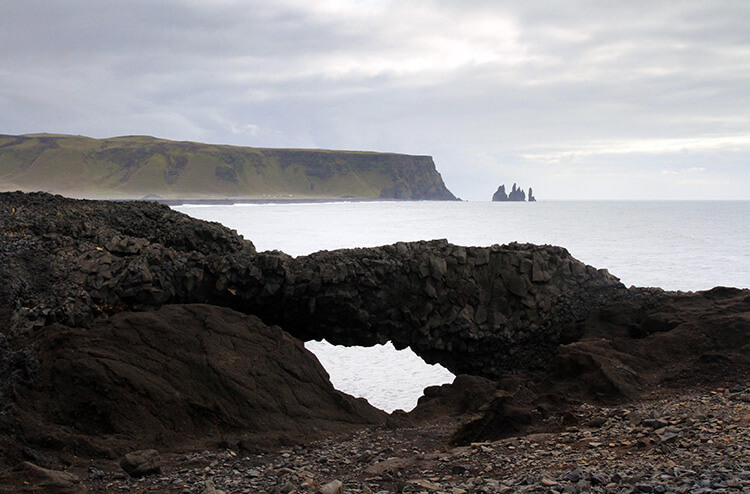 Getting its name from the massive “door hole” arch that the sea has eroded, Dyrhólaey is a huge promontory jutting out in to the sea. It was formed some 80 thousand years ago in a submarine eruption. It’s a favorite nesting spot of eider ducks and puffin, so the environmental agency typically restricts access to Dyrhólaey from May 1 – June 30. But any other time, it’s worth a stop for the view out to the needle-like Reynisdrangar rock formations and to play on the black sand beach below the promontory. Just be very careful as the rip tide and current here is incredibly strong, and unsuspecting tourists have been swept out to sea here and on the Reynisfjara beach. There’s also been a lighthouse at Dyrhólaey since 1910. The lighthouse keeper of many years was also a sheep farmer, and you can see the ruins of that farm not far from the lighthouse. In 1991, the American journal Islands Magazine counted the black sand beach of Vík as one of the ten most beautiful non-tropical beaches on Earth. It’s easy to see why. Vík is Iceland’s southernmost village and faces the open Atlantic Ocean, framed by a long black volcanic sand beach. Nearby the spindly Reynisdrangar rock formations stick out of the sea, and as the legend goes, were formed when trolls attempted to drag three ships ashore. The mountains of Pétursey, Hjörleifshöfði and Hafursey stand towering over the village of just 450. Beautiful, but dangerous. Vik lies directly under the Myrdalsjokull glacier, which itself sits atop the volcano Katla. Katla last erupted in 1918 and speculation is that a big eruption is brewing, which will be much more powerful than the 2010 eruption of Eyjafjallajökull. The eruption could melt enough of the glacier to trigger a flash flood, obliterating the village. The village church, high up on a hill, is believed to be the only building that would survive the flood. Vík has one of the few service stations between Skógar and Skaftafell, so while you’re there take some time to enjoy the beach and a different perspective of Reynisdrangar. The Wool Center is also worth a visit. Be sure to go up to the second level balcony where you can see women hand-knitting Icelandic sweaters. Jökulsárlón literally translates to glacier lagoon, and any Icelander will know exactly what you mean if it you simply call it glacier lagoon. 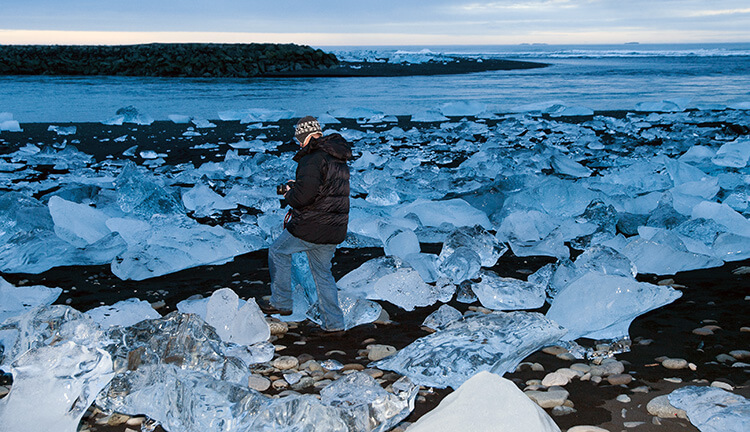 Because let’s face it: can you really pronounce Jökulsárlón? The largest glacier lagoon (yes, there is more than one just like this) and lake in Iceland, it branches from the Vatnajökull glacier. One of the natural wonders of Iceland, Jökulsárlón evolved into a lagoon after the glacier started receding from the edge of the Atlantic Ocean. The lake has grown since then at varying rates because of the melting of the Icelandic glaciers. The lagoon now stands 1.5 kilometers (0.93 mi) away from the ocean’s edge and covers an area of about 18 km2 (6.9 square miles). It’s the deepest lake in Iceland at over 285 meters (935 ft) deep. The lagoon developed only about 60 years ago when the entire area was only 250 yards from the Atlantic Ocean, and 2 miles (3.2 km) away from Vatnajökull . Vatnajökull, the largest glacier in Europe, was at the shore line of the ocean and dropped icebergs into the ocean. However, it started drifting inland rapidly every year leaving deep gorges en route, which filled with melted water and ice fragments the size of trucks. These icebergs gather at the mouth of the lagoon’s shallow exit, melt down into smaller ice cubes and roll out into the sea. While floating, only about one tenth of the mass of an iceberg is seen above the water’s surface. These icebergs are seen in two shades: one type in milky white, while the other type is bright blue in color. It’s an interplay of light and ice crystals. Black ash from the volcano Grímsvötn can be seen streaked through many of the icebergs. Take a boat ride and sail among the huge icebergs. It’s truly an amazing experience, even when it is raining sideways like on the day we did the boat ride. The ice from the glacier is over 1000 years old and you might be lucky enough to taste a piece like we were! Seals are always swimming in the lagoon or lying on icebergs sunning themselves as you sail by. After the boat ride, warm up with some fish stew in the visitor center. And then head across Highway 1 to the Diamond Beach. Huge melting icebergs have washed ashore on the black sand beach and you can try to scramble up their slippery surface. 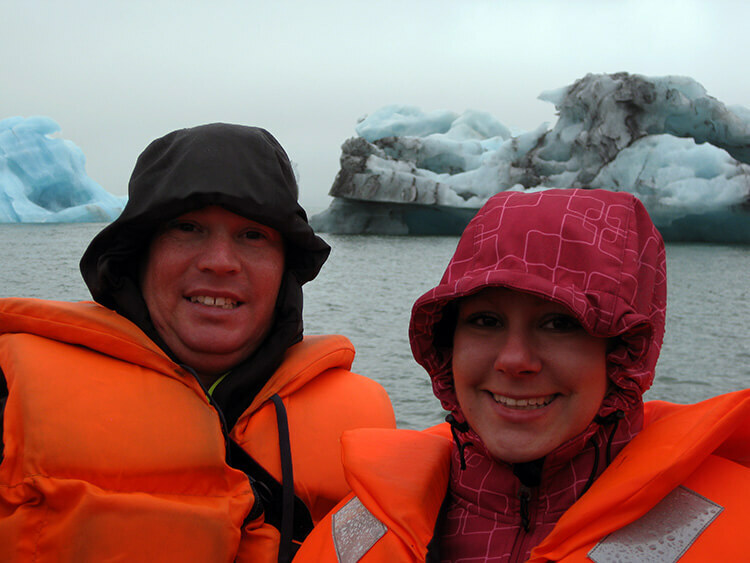 You can tour Jökulsárlón on the amphibian boat tour for 5500 ISK per adult and 2000 ISK per child 6-12 years of age, on the zodiac boat tour for 9500 per adult and 5000 ISK per child 10-12 years of age. Children under 10 are not allowed on the zodiac tours. Book online as these tours tend to sell out quickly. Our trip to Iceland was sponsored in part by Go Iceland, who provided us with a 4×4 Dacia Duster in order to bring you this story. All opinions about places visited are entirely our own. I was there last September as well and was blown away by the beauty of the place! Did you go to Gullfoss as well? Hi Andrea! Iceland is fantastic, isn’t it? Yes, we did go to Gullfoss as well and got shots with the rainbow. Amazing! You can feel the power of the water as you get blasted with the wall of spray while walking down the path. The swimming pool is so atmospheric. Definitely one of the coolest swimming holes I’ve ever been to. Glad you found that one on your visit! Your own car is definitely the way to go in Iceland. I don’t mind small group tour in cities sometimes, but overall I enjoy discovering the hidden gems. And half the fun of these is finding them in the first place! I’m happy to report that these are hidden enough that tour buses won’t ever haul tourists out by the busload. The turf house sounds fascinating! It’s hard to believe someone lived there until 1946! The turf house is surprisingly huge inside with two stories. It is amazing that the family lived there until 1946 as modern conveniences had definitely come along by then. We are going to Iceland in a couple of weeks and trying to figure out our itinerary. Thank you for all of the info. We plan on taking a lot of pictures and making a film about our adventure. If you have any additional info that would be great! 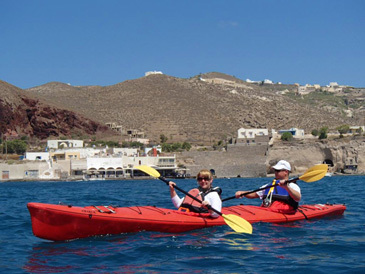 We are adventurous at heart and ready to do any mind boggling non tourist attraction. We tried to book the photographer you guys used for the northern lights but he was booked. Hopefully we can catch that while there. I did look through that. Very impressive. We have 7-8 days to travel.once in Iceland. I do feel ambitious to do the whole ring. I am use to snow driving coming from the midwest. We rented a light 4×4 (which in my opinion is better for winter driving). Since we don’t have a full 9 days to do the ring I wonder if we are spreading ourselves thin and will feel like we need to rush to get through it all. If that is the case is it better to do the south side of Iceland starting from Reykjavic to Husavik (Though at that point it seems like we might as well finish it off going around the north). Also is the lodging pretty flexible as far as showing up the day of to find a room? Booking places in advance is great but if snow slows us down it may throw the schedule off. Any thoughts on all of this? The road from the ring road to the plane wreck at Sólheimarsandur is now closed by the landowners due to destruction of private property from off road driving. The landowners had a meeting yesterday (14/3, 2016) and discussed what to do and they decided to close the road until they can find a permanent solution or until the land dries up, which ever comes first. You can still access the plane but one has to walk there. We think it is so sad that tourists were disrespectful and the landowners were forced to make this decision. We really hope our beloved Iceland isn’t being ruined by tourists that aren’t careful to take only pictures and leave no trace. Hey Jennifer, My husband and I will be traveling with our 8month old son. How is the 20 min walk to Seljavallalaug? Do you think it’ll be doable with our son in a Ergo carrier? Hi Brooke! You have to cross a river at several points by balancing and jumping from rock to rock, that is unless you don’t mind getting your shoes wet and just wading across. But it is a glacial river, so the water is always cold. I guess it would depend on how comfortable you were carrying a kiddo while doing that. You’re the one that knows by your hiking ability and comfort level. I’m actually going to Iceland later this week, did you make an appointment with the owners of the Kelder farm to visit the turf houses or did you just show up and were lucky enough to see the inside of the house? I’m trying to figure out last minute how to get a visit of a turf house, if at all possible. Hi Constance, yes the owner was expecting me and I arranged to visit even though the farm was closed in order to write about it. They are very friendly and if you notify them in advance, I’m sure they would be happy to receive you at the farm as well. leave at 6:00am is that doable? March 2- We haven’t figured that out yet where to drive to and stay our last night. Our flight on March 3rd leaves in the afternoon but don’t want to have too long a drive before a long flight. Any ideas? Your itinerary looks good. I know you already changed the one night to stay closed to the ice cave tour. When it comes to drive times, pretty much just double what Google maps tells you because it is so incredibly picturesque that you’ll constantly be stopping for photo ops. It’s good you have at least 2 days in the North. You won’t be able to cover it all in the 2 days. There’s a lot to see, particularly in the Myvatn area. Thank you Jennifer for the information. After we made our itinerary I did look at your recommendations and we are nearly spot on. Also thank you for the idea for our last night. It does seem like a long drive from Siglufjordur to the Reykjanes peninsula. I’d like to get your opinion for another option. We were wondering about driving from Siglufjordur (where we’re staying for 2 nights) to somewhere on the Snaefellsjokull peninsula where we could stay 1 night. In order to see some of the peninsula we were thinking going toward the end of it so we could cover part of it the first day. Then the next day, see some of the other side before going to the airport to catch our flight home. I know that’s a lot of driving also but what do you think? Thank you ! I would very much appreciate your guidance on this. It’s a 1 hour 30 minute drive from Kopavogur to Keldur. I’d plan for an hour to visit the turf house. You can then continue on to Seljalandsfoss and Gljufrabui, which are right next to each other and about 30 minutes drive from Keldur. I’d plan to spend around 1.5 hours there total between the two waterfalls. Seljalandsfoss can be walked right up to and entirely around in 30 minutes or so, depending on how many people are there. Drive a little further down the road and park at the camping area in the interest of time to visit Gljufrabui. It takes about 30 minutes to climb back to the waterfall. It then takes about 20 minutes to get to the Eyjafjallajokull visitor center. You won’t have time for any tours on Eyjafjallajokull, but you can take a beautiful photo from the road with the farm and visitor the small visitor center about the eruption. You’ll probably spend about 30 minutes here. By this time, it will be around 12:30pm. Drive on to Skogafoss, which is just 10 minutes past Eyjafjallajokull. Depending on if you walk up to the top of Skogafoss or just take some photos from the base, you could spend 30 minutes – 1 hour here. You might also want to have a quick lunch as there’s a nice cafe at Skogafoss. It will be another 30 minute drive to Dryholaey and you’ll need at least an hour there to go down to the beach and lighthouse. From Dryholaey, it’s another 30 minutes drive to Vik. Don’t skip Reynisfjara Beach with the basalt columns. If you left earlier from Kopavogur, you could make it to Vik by 2pm. 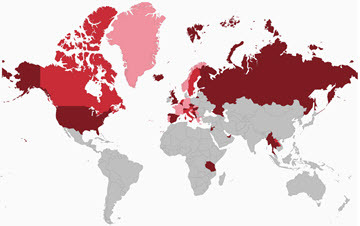 With all the stops along the way though, plus factoring in that July will be the busiest month with the majority of tourists visiting these sites, it would be cutting it close though. I’d aim for the 6pm zipline tour. Jökulsárlón is another 3 hour drive each way from Vik. You definitely cannot make it there and back to Vik for even the 6pm zipline tour. But if you’re short on time for your trip itself, the good news is that the sunset isn’t until after 11pm in July in Iceland. So if you’re really ambitious, you could drive from Vik to Jökulsárlón after you finish the zipline and arrive before the sun sets. But you won’t have time to do any of the boat tours there. If I were you, I’d just stay in Vik after your zipline since it will already have been a long day at that point. Then take a full day to drive out to Jökulsárlón and explore, also stopping at Svartifoss either on the way there or back, and drive back to Reykjavik for that night.